The sky looked like this. In keeping with the new ride schedule, I had waited until sundown to head out for an evening cruise. Up ahead, I saw the rancher park his truck on the left side of the road, and walk across to set his trash out for pickup on the right side. He turned immediately to walk back to his truck, but looked my direction and stopped. There was a slightly uncomfortable moment for me as he stood there, apparently waiting for me to arrive, or pass by. But why? When I came near, he smiled, pointed to the front of my bike, and exclaimed, "That...is one...bright...light!" What was at first slightly uncomfortable, became handshakes, introductions, and neighbors talking in the middle of the road at twilight. Our conversation covered pasture, fences, creeks, and cows. It dabbled a little while on bicycle lights. He told me about having a bike when he was a kid that had a bottle generator. He filled in the details of my approach from his perspective. When he turned to cross back to his truck, he saw the light and thought I was riding a motorcycle. Of course, since I was on a bike, he had plenty of time to cross the road in front of me. He realized I was going a little slow for a motorized vehicle, but even then he wasn't thinking about speed. He said, "At first, I thought that was the quietest motorcycle I've ever seen!" When he finally realized that it was a bicycle approaching, he knew that he'd been fooled. Fooled by the Edelux before it was even dark. As we parted, he complimented my light again. Nice neighbor. As I've said numerous prior times, a ride around the block for me is 3 miles. I've referred to this, which is one of my favorite rides, the 3-mile loop. And as I've said before, I often take advantage of just a few minutes to get out on the bike and enjoy that wondrous sensation of balance and momentum. I like to track how the views change from season to season, and as weather conditions change from hour to hour. In fact, seasonal changes in combination with lighting variations during the day can call attention to things I've never seen before. Delightful new discoveries in the midst of the familiar. Like marriage, for example. Even looking different directions from one spot can make a huge difference. Right here on my charming 3-mile loop, and just around the corner from my little house on the prairie, is this one little spot, from which all three of these photos were taken...within minutes...all within 45 degrees of the compass, looking west, west-northwest, and northwest. It's wasn't easy to get up for a 5:30am rollout, but it was worth it. I find enduring an early alarm easier than triple digit temps and 25-35mph winds. 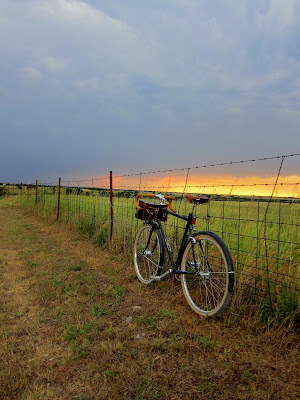 Aware of the windy forecast (it was already blowing pretty strong at departure), I worked my way south on a mix of paved and gravel roads to the Denton Greenbelt Trail, rode about 6 miles of it, and ended up at the southern end. After a brief, but scenic tour of downtown Denton, I returned along my traditional bicycle commute route. That route basically is a choice of going west, or north. On the west portions, I leaned into the cross wind and worked to maintain a line among the gusts. On the north portions, I was amazed by the mixed sensory signals my brain was receiving...tired legs, still air, but a landscape going by very rapidly. After almost 5 hours on the bike, I had just enough time to get cleaned up and have a big lunch before that afternoon nap overcame me. I've been itching to find a new place to go camping. For me, the S24O of my imagination looks something like those excellent images I see of folks camping on Mt. Diablo, near Rivendell headquarters. We just do not have such vertical variety out here on the prairie. 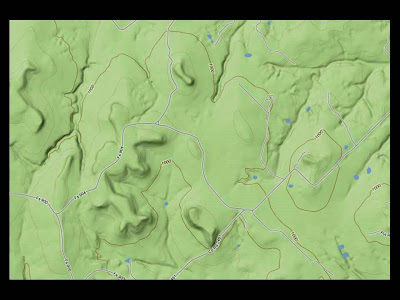 However, there are some nice hilltops within S24O distance that might be quite suitable. Finding one was the purpose of today's LBJ National Grasslands reconn expedition. To minimize travel time, and maximize on-site reconn time, I carried the bike in the pickup. I found a relatively high spot that had a breeze and a shade. The nose of my truck is sticking out of the trees, just past the curve. It was a nice spot for a sort of "base camp". Without a map, I simply pedaled off to explore for awhile, and return for a bit of shade and a water bottle refill. Then I'd set out in a new direction. It was only for the morning, but my base camp served me well. Just beyond the shade cover of my base camp, I was able to enjoy my first "view". This was a good sign. 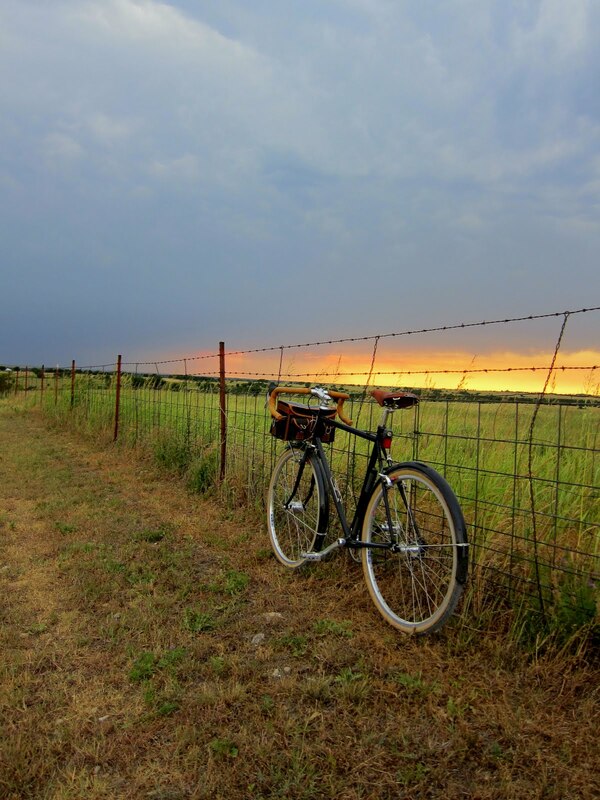 I pedaled on with a heightened sense of optimism. There must be a great camping spot around here somewhere. 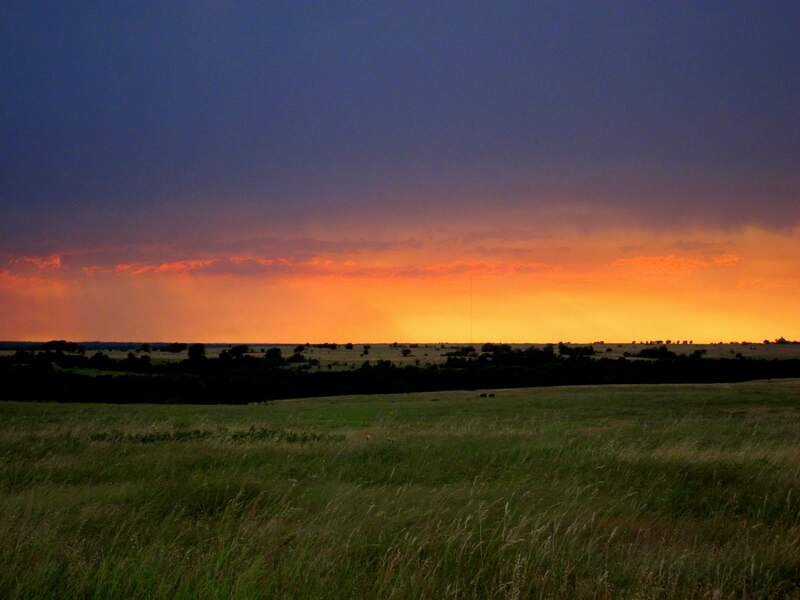 The LBJ National Grasslands are located north of Decatur, Texas, and about 30 miles from my house. 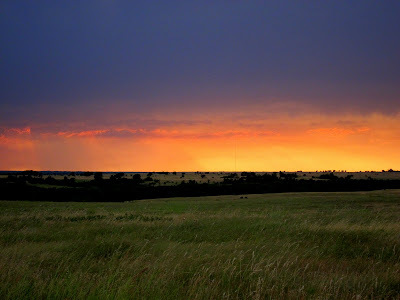 The area seems to be controlled by the Forest Service, and is a delightful mixture of wide open grasslands, spotty tree and brush cover, and rolling hills. There are plenty of gravel roads to explore. Based on my limited reconn, it appears that the area is a favorite of horse riding enthusiasts. They haul their trailers, find a nice place for their own base camp, and explore the vast network of trails. These folks found a spot with plenty of water, but most of the area is rugged and without the comforts afforded by more "developed" commercial or state park campgrounds. Certain adjustments to a more primitive style will be required for me to camp here. 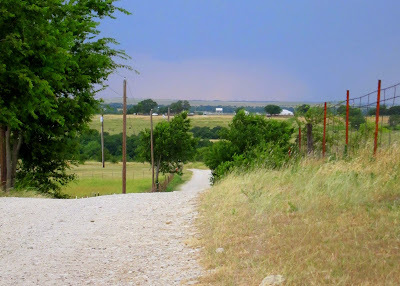 At first, I kept to the gravel roads to simply get a sense of the general area. There were many trails that I rolled by that could be explored another day. Another use of this land is for oil/gas activity. There are some of these guys dotting the area. Most are located some distance off the main gravel road. This one (inactive), however, was larger than average, so I turned in to take a look. Bicycle parked at base for a sense of scale. Sometimes, the double track looked attractive and I left the main gravel road to explore further. Most of the time, it would either fade to nothing, or turn into a trail for the horses and hikers. It seems whenever I do not have a planned route, like water, I end up at low elevations. Why is that? Apparently others have ended up here also. It seems to be a well-used swimming hole. The swimming hole was a part of a finger from one of the more prominent lakes in the area. I believe the main body of the lake is just beyond the view (and to the right) in the photo above. So much for noodling around. It was time to climb out of that hole into which gravity had drawn me, and find that prized hill top camping spot. 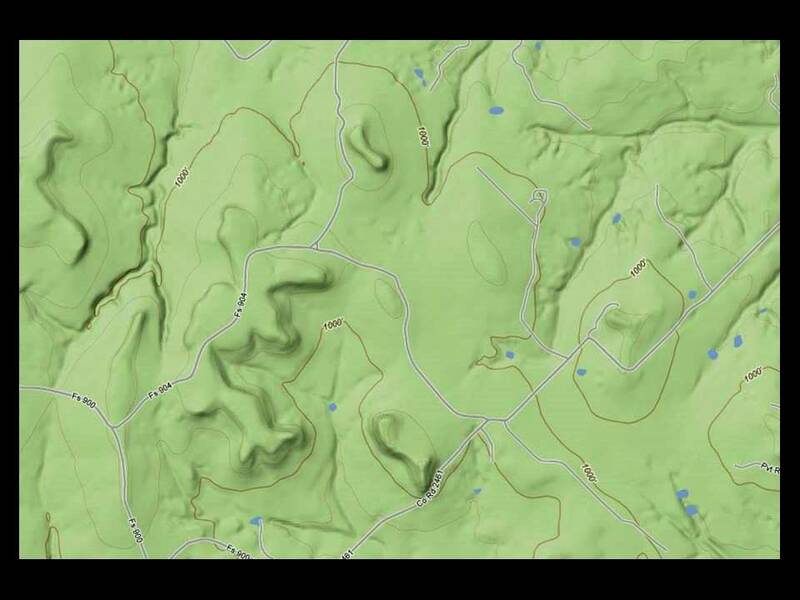 My target was at the crest of one or more of those more prominent topographic features shown in the map above. I hiked to the top of a couple of those features. I found wildflowers, cactus, and pleasant breezes. I found color-tipped grasses contrasted against the green tree tops. In some places, I could see multiple ridgelines. In others, I only saw the next ridge across the valley, and bits of the road I had been on a little while earlier. No, it is not as high up as Mt. Diablo, but things were looking pretty good. Now, where would be a good spot to set-up camp? Ladies and gentlemen, we have a winner. This view is looking northeast, and I believe watching the sunrise from my tent door right here would be nothing short of spectacular. Can you imagine how excellent the stars would be out here? Yeah, me too. It's time to get this trip scheduled. When it was time to load up the bike and drive home, I figured out why the last few miles of Saturday's ride were really wearing on me (in addition to the heat, and time in the saddle). I had decided to ride to my brother's house in Colleyville for some good ol' fashioned family time. Mrs. Pondero followed in a motor vehicle, allowing me a one-way bike trip (which was plenty today, thank you). But a flat tire doesn't really directly relate to my title for today's post. Actually, I must make a confession. For all my righteous proclamations about not being a slave to training, the racing mindset, and speed, yesterday I faltered. Somewhere between Denton and Roanoke, on US 377, I let my mind lapse back to those days when I had some semblance of fitness. On US 377, there are a healthy number of roadies and tri-geeks all kitted-up. They are (mostly) lean and fast(er than me). Back in the day, I enjoyed the challenge of spotting a rabbit down the road. Each one was a bridge-to-breakaway situation, and I relished the opportunity to drop a cog or two and turn on the speed. When I saw a couple of riders ahead, that weren't pulling away from me very fast, the old fire was ignited (or maybe it was just the Texas sun). I gave chase. Riding the Kogswell P/R, with cushy 650b tires at 45psi, fixed wheel drive train, and characteristically un-aerodynamic boxy Berthoud front bag (full of coffee, water, and snacks), I gave chase. Not having other gear options, I simply pedaled faster. About 100 rpm on a 66-inch gear is not terribly fast, but I closed the gap. Seeing the two cyclists in front of me grow in my eyes, was like a jaguar inching close enough to smell its prey. I pedaled faster. When I could tell that I made most progress on the climbs, it was like the old days where my small size and light weight gave me an advantage. I was back in the groove, and for a moment it felt like the old days. But only for a moment. I exploded. I was suddenly reminded that I have no fitness. After a mile or two at what was clearly an unsustainable pace, I blew up like some over-hyped top fuel dragster engine. And just like that I sat up gasping, and watched them disappear over the next ridge. I told myself that I didn't care...that I'm just a tourist on my way to Colleyville and NOT in a hurry. Evidently, however, I wasn't listening to myself. After plenty of time for recovery, I encountered another group of cyclists. In fact, they pulled onto the road right in front of me. Well, almost right in front of me. They were probably about 100 yards up. Actually, one guy was lagging the main group a bit, and preparing to bridge up. He was only about 20 yards in front of me. You already know what I was thinking. If I caught him, he'd tow me to the group, and I'd be able to sit-in for just a little while (for old times sake), and then ease off and let them go. So I stood to accelerate. Unfortunately, so did my helper. It was obvious that he didn't want to waste a bunch of time chasing the group in the headwind, and he certainly didn't see me as help. Then I gave it everything I had. He was so close, surely it wouldn't hurt long. It didn't. I never gained on this guy an inch, and I exploded within seconds. I sat up again. I tried to get some air into my lungs. And as the spots in front of my eyes cleared, I saw them, all as one beautiful peloton, sail away from me. So I have a confession to make. Forgive me, for I have lusted for speed. For a few moments, I wanted my race bike, my fitness, and my youth back. I imagined doing interval sessions. I even imagined a new lightweight bike with no racks and bags...and brifters. Brifters! Oh, how far I've fallen. I eventually made it to my brother's house. We had a great time watching my nephew play little league baseball. We grilled burgers, and ate ice cream. We watched more baseball. When it came time to head back to the prairie, I wheeled the bike around and noticed that it didn't roll well at all. That fat tire was squashed flat. But the flat tire, and the photo above doesn't have anything to do with my confession. At least I don't think so. You don't think that there are consequences that come to old men who lust for speed, do you?